> XO Communications > Is Your Phone System Holding You Back? Is Your Phone System Holding You Back? Enterprise communications is at a critical juncture. Employees require the very best mobility and collaboration tools while IT struggles with tight budgets and lean staffing. 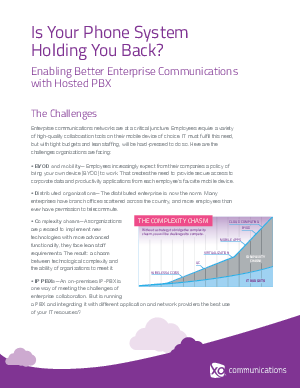 Read this paper to learn about these looming challenges and how hosted PBX with Unified Communications can help you address these issues, paving the way for better enterprise communications.